Bonhams can usually be relied on to supply some oddball motorcycles in their auctions—but I haven’t seen the likes of these Triumph sprint bikes before. They pre-date George Brown’s Super Nero and Alf Hagon’s designs, and they’ll be going under the hammer on 24 April in Staffordshire, England. 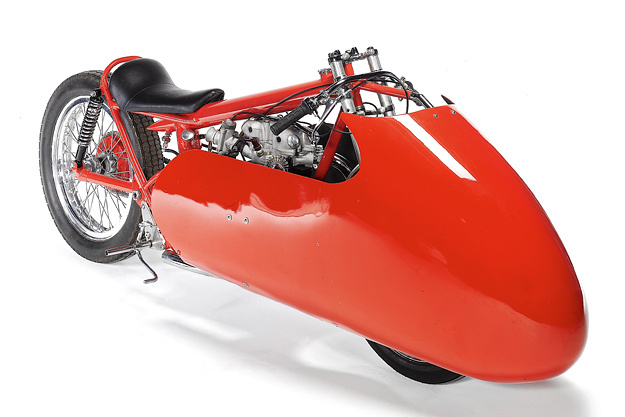 There’s a great story behind the ‘Peril Speed Equipe’: the three sprint bikes were built by a cabinet maker called Bill Bragg, who first took up circuit racing in the mid 50s with a Triumph sidecar outfit. According to Bonhams’ notes, “A big crash at Crystal Palace resulted in several months in hospital and Bill transferred his allegiance to sprinting. Although most of his engineering skills were self-taught, Bill’s radical ideas on how to get a motorcycle down the quarter-mile as quickly as possible would turn out to be highly influential.” Once out of hospital, Bragg created the first double-engined sprint bike, ‘Twin Thing’, but struggled with the synchronization of the engines. In 1960 he reverted to single Triumph 650 motor, and built a sprint frame with fuel stored in the top tube and oil in the downtube. 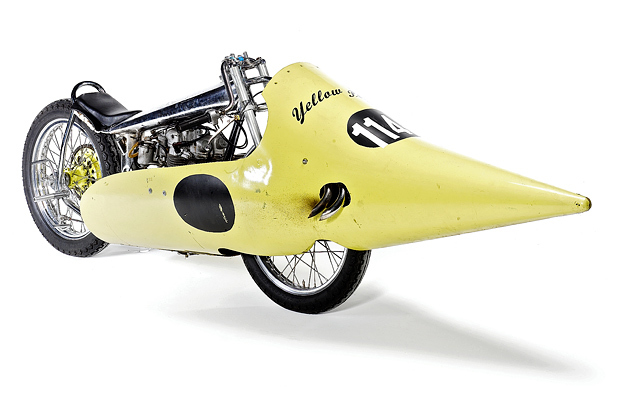 That yellow fairing is a fiberglass fuel tank from a P51 Mustang fighter; a trick used by several ‘Lake Racers’ in the US but another first for the UK. “Amazingly, the tubes for all Bill’s frames were bent by heating to red hot and then bending them in the grill of the drain in the gutter outside his house,” Bonhams reports. “The rest of the specification comprised a Norton/AMC gearbox and clutch, and twin Dell’Orto carburetors. 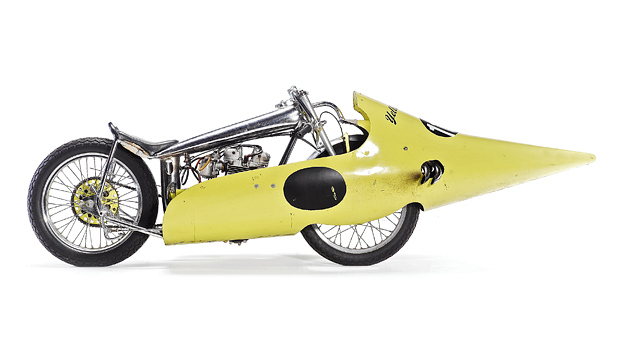 This simple set up formed the basis of Bill’s many sprint and drag race bikes for the next 40 years.” ‘Yellow Peril’ ran the quarter mile in 13.39 seconds, and was followed by ‘Scarlet Peril’, which Bill gave swinging-arm rear suspension. ‘Blue Peril’ went one better with the addition of a supercharger. “Bragg is credited as the first person to supercharge Triumph twin engines, and he was helped by the Allard Motor Company, which supplied the Shorrock supercharger. Once the initial fuel starvation problems were overcome the bike ran 11.19 seconds for the quarter-mile, very much on the pace for that period.” The bikes then disappeared, and were recovered in strange circumstances: check out the auction notes for the full story. If you’d like to put the Equipe in your garage, Bonhams estimates that you’ll need between $32,000 and $39,000. 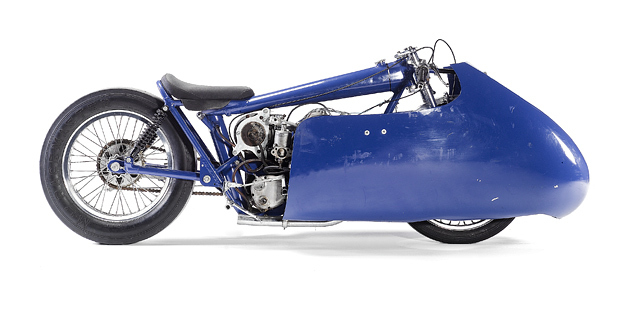 Bonhams’ Important Pioneer, Vintage and Collectors’ Motorcycles and Related Memorabilia auction: online catalog.